I was there. The 1984 Olympics in LA. As a younger version of myself I had been interested in watching the Olympics on TV even though I have never been a particularly sporty individual. In 1976 I painted a large collage on butcher paper commemorating some of the more highlighted individuals that won medals in those games. I closely followed the 1980 Olympics. So, in 1984 when my sister asked me if I wanted to attend the Olympics with her, my answer was a resounding yes. Her interest lay in the field hockey competition as she had recently landed a college field hockey scholarship. We lived in upstate New York at the time, she was eighteen, I was nineteen, and we headed off across the country for a grand adventure. I have to say that it was an amazing experience. The thing that stands out mostly in my mind is the electric atmosphere and the cheerful camaraderie of everyone around us. People from all over the world at the events, on the buses, at restaurants, at shops and on the street were bubbling with enthusiasm and friendliness. We stayed in a dormitory room at a sorority house that was renting rooms to travelers for this event. Each morning we would hop on an hour long bus ride to East LA to watch the Men’s Field Hockey competition. You are probably unaware that Pakistan ultimately won the gold medal for this tournament. Now you know. After each game we would head back on the bus and meet up with a childhood friend of mine who was attending UCLA. She would take us to have dinner and such at the swanky hotspots in the surrounding area. We would then try to catch up on the results of some of the other competitions from that day. It was a bit more challenging to find out what had been going on with all of the hubbub of being in the middle of it all and the fact that in those days we didn’t have all of the portable electronic devices that we have now. That’s right; no cell phones or internet. We managed, though, and had a great time doing it. It was an awesome trip and kudos to my sister for organizing it. Unfortunately, for some reason, I don’t seem to have any pictures from this memorable event, but I do have two souvenirs that I will always cherish. 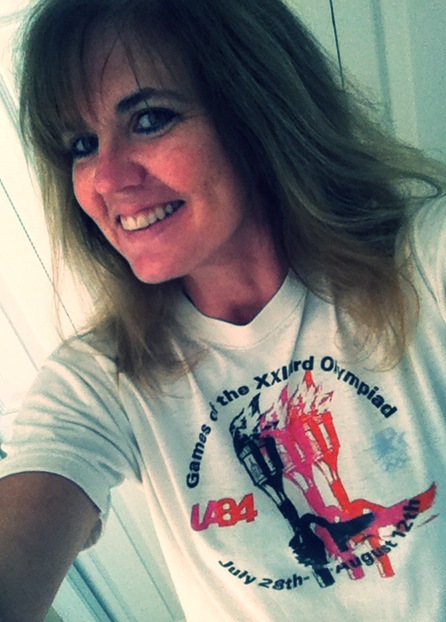 One is an ’84 Olympics t-shirt that I am afraid to wear and wash because it’s so old. I did don it for the picture for this post, however. It’s nice to know that it still fits! The other is an official silver pin from the 1984 Syrian Olympic team. It was given to me by a member of the Syrian Olympic committee when they asked my sister and my friend and I to join them at their dinner table at The Cheesecake Factory in LA on one of those Olympic evenings. Three young American girls sharing cake with the Syrian Olympic Committee. Unusual in most circumstances, but just right for the occasion. The spirit of togetherness and the desire to put differences aside in the pursuit of friendly completion was so palpable and evident those few days that I spent at the ’84 Olympics. I have fond memories of being in the middle of this concept and atmosphere. I send well wishes and a hearty cheer to those participating in and attending the 2014 Olympics that have commenced this week. May these games and this spirit always continue.